(2010) Matching Trust grant of $30,000. The purpose of the Pure Water Campaign is to build a waste water treatment plant and system. 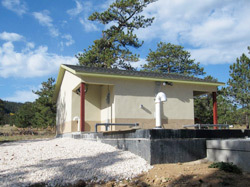 This new water treatment system is necessary to meet the compliance requirements placed on SMC by the state of Colorado. Because there are specified time lines, the construction will be in three phases: The first phase, the building of the plant itself, must be completed by December 2011 and will cost $1,400,000. 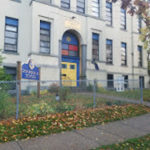 The second phase will create the initial collection system and is scheduled for the fall of 2011 at a projected cost of approximately $300,000. The third phase are additions to the collection system going to the Stupa View housing modules and then over to Red Feather Conference Center. It is scheduled for the fall of 2012 and is projected to cost approximately $400,000. The demands of the state must be met as SMC will not only be unable to build new facilities, it will be shut down. In addition to meeting compliance requirements, our capacity for programs can increase from the current ceiling of 520 to 650 people daily. This gives greater flexibility for programming and the potential for increased revenues. The plant is designed with future expansion in mind and will serve up to 1,250 people when completely built out. The plant will be located south west of the facility building, and will be partially built into the sloping ground with earth pushed up to cover most of the remaining portion. The plant site will cover an area of approximately 30′ by 30′. Construction is scheduled to begin in November 2010 in order to avoid frozen ground and continue on into January-March for completion. If the state process delays the beginning of construction this fall, we will start in early spring in order to meet the deadline for plant completion by the fall of 2011. In the fall of 2011, the first stage of the collection system will be built. It will concentrate on gathering waste water throughout the downtown area including Sacred Studies, Shotoku, the kitchen and lodges. In Stage II of the collection system, pipes will connect to Stupa View housing modules and Red Feather Conference Center.